Despite their similarities and incessant chase to faster lap times, the difference between braking systems in both series is quite large. 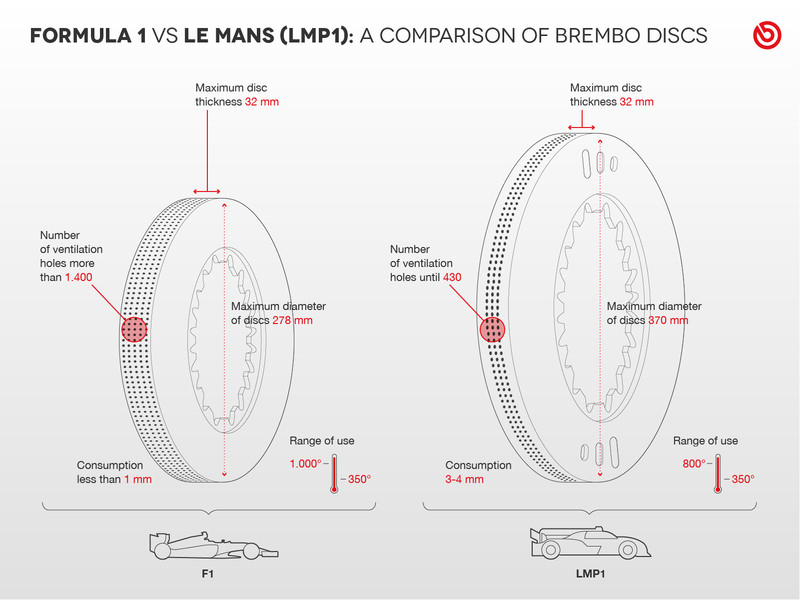 In Formula 1, there is a lot of intense deceleration where the values often surpass 5G (at Monza it gets up to 6.7 G), but at the 24 Hours of Le Mans, the braking force does not go over 3.5 G.
The reason for this wide gap is the difference in mass of the two prototypes. A Formula 1 single-seater has a minimum weight of 733kg including the driver while an LMP1 car racing at Le Mans weighs at least 875kg plus 3kg for camera gear or a spare power pack. Of course, non-hybrid LMP1 cars can weigh up to 45 kg less, which means the overall weight drops to 833kg. To prevent this from happening, friction material for discs and pads are on offer with more efficient thermal conductivity. To get around this problem, a comparison was made between the hardest braking done in the two competitions, calculating the average deceleration of each as it relates to braking time and distance. 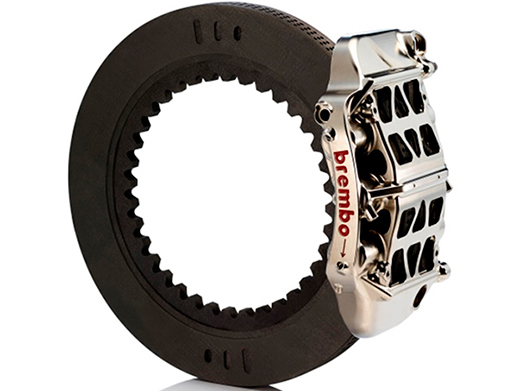 In general, the Formula 1 and LMP1 cars are very different and their behavior during braking can't and shouldn't be attributed to the brakes alone. The race cars have different weight distributions and aerodynamic loads, but even more importantly their tires differ in size and compound, which plays a significant role in braking performance. Although not perfect, this comparison still provided interesting results. On Chicane 1 at Le Mans (turn 5 on the track), the LMP1s arrive going 208 mph and they brake for 3.21 seconds during which they travel 195 m. The cars enter the corner at 68mph thanks to the driver applying a load of 220 lb on the brake pedal. Deceleration during braking hereby peaks at 3.5 G.
In comparison, F1 cars entering Parabolica at Monza (the last turn on the Italian GP track) brake from 314 km/h to 204 km/h in just 1.22 seconds, on a stretch of track that only measures 72 m. The drivers are required to apply a remarkable amount of force: 6.7 G in deceleration and a load of just over 200 kg on the brake pedal. That means a Formula 1 race car is able to drop more than 88 km/h [314-204 km/h)/1.22] in one second, while the top-end LMP1 cars can only reduce their speeds by 69 km/h [(334-110 km/h)/3.21] per second. The numbers of braking performance in F1 are confirmed also when looking at high downforce tracks like Singapore and Monaco. On Turn 1 of the Marina Bay Street Circuit in Singapore, the Formula 1 single-seaters brake for 1.98 seconds to go from 294 km/h to 135 km/h: That means in one second they drop more than 80 km/h. And on the first corner after the tunnel (Turn 10) at the Monaco GP, the single-seaters go from 286 km/h to 93 km/h in 2.03 seconds: In essence, in one second they decelerate 95 km/h. The difference may seem minimal, but said another way it really is impressive: In 72 m of braking, the Formula 1 single-seaters go down more than 105 km/h, while in the same amount of space the LMP1 prototypes decrease their speeds by about 69 km/h. In short, Formula One cars display superior braking performance to LMP1 cars, thanks to a varying number of factors. But then again, they'd all end up with worn brakes after just 1/8th of the distance of the 24 hours challenge that is Le Mans.